**SPOILER ALERT – ALLEGIANT is the last in the Divergent series so there may be spoilers for earlier books in the series (although I have kept things spoiler free so far as this book goes). If you haven’t read the first, Divergent, you might want to head over to my review of that HERE instead. Up to the second book, Insurgent? My review mini is HERE. The faction-based society that Tris Prior once believed in is shattered – fractured by violence and power struggles and scarred by loss and betrayal. So, when offered a chance to explore the world pat the limits she’s known, Tris is ready. Perhaps beyond the fence, she and Tobias will find a simple new life together, free from complicated lies, tangled loyalties and painful memories. But Tris’ new reality is even more alarming than the one she left behind. Old discoveries are quickly rendered meaningless. Explosive new truths change the hears of those she loves. 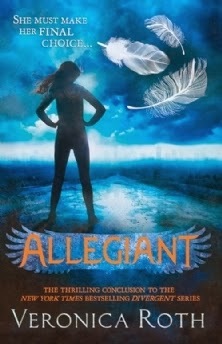 And once again, Tris must battle to comprehend the complexities of human nature – and of herself – while facing impossible choices about courage, allegiance, sacrifice and love. If you’ve even remotely followed this series as it’s flown around the blogosphere, I can’t imagine that you managed to avoid the furore that surrounded the release of the final instalment at the end of last year. People’s reactions seemed to range from utter emotional devastation to out and out rage. I’d gone into Allegiant expecting more of the same high drama, fast action and semi-political wranglings that graced the pages of the first two. The hurtling pace was still there and there were times when I managed to stop rolling my eyes and sighing in a melodramatic manner long enough to be gripped by what was going on but, when it comes down it, I just wasn’t a big fan. It was ok but not at all the life-suspending read I was looking forward to, was disappointing. Perhaps surprisingly to those that have read it, it wasn’t the ending that made this a bit of a retrospective dud but the plot generally. For me, the first two books were made great by the idea of society being divided into factions. People living according to one defining characteristic and balancing governance and responsibilities for the protection of that society according to those attributes was a great idea that was executed well. As Tris, Four and her band of loyal friends go Beyond the Fence, they more or less leave behind the factions and instead step into a world with a far less engaging and considered conflict based on some flimsy history and some even more wobbly science. I won’t go into too much detail about it all because I don’t want to spoil it for those of you that haven’t made it to this book yet but I will say categorically that the factions were better. There was no need to completely shift the focus and try to set up and resolve a global conflict within one book and it just felt under-developed as a consequence. Shelving pretty much everything that readers have come to love in the first two books of a trilogy and wandering off onto a tangent that just has no traction is brave in some ways and I suppose worthy of at least a small nod of praise. But “genetically pure v. genetically damaged” backed up with some shaky explanations and some excellent glossing over of anything that might make it stand up to more thought? As weak as it sounds. I never bought into while I was reading and I haven’t bought into it on reflection. We also have a split narrative this time around, with the story being told both from Tris and Tobias/Four’s perspectives. Super. I have no problem with having more than one narrator. Actually, I’m quite a fan of the device in general. Here, though, I found that I kept forgetting who was “speaking”. Both characters are now at the stage where they are internally conflicted and are having family problems and are all but indistinguishable in tone. Both also seemed to be all too happy to put aside their worries and feelings of grave betrayal/upset/general anger any time an opportunity to snog in a hallway/empty room presented itself. Maybe I’m not enough of a romantic or maybe it’s been too long since I was a teenager but sporadic kissing in corridors does not a romantic sub-plot sustain. The relationship that has been lauded generally as being realistic in its troubles just became silly for me. Sorry. Oh, and while I’m on the characters, pretty much all of the characters that you’ve come to know and love from the first couple of books will be put to one side so that you can spend some time with those that populate Beyond the Fence world. I suppose I couldn’t let the whole review go by without at least mentioning the thing that had people talking, sobbing and/or throwing things. When I started reading Allegiant, I had no idea where The Incident occurred and I spent the whole time waiting for something to make me incandescent with fury. It isn’t right until the end so if you’re planning on reading this and might be in the hyper-aware state that I was for the first half, you needn’t worry. And The Incident? It was a bit of a shock but not at all the trauma that I had come to expect and hasn’t really impacted on my feelings towards the series in any way. By that point, I was too exasperated with the whole experience to really care a great deal what happened to any of the characters and I didn’t cry once. Unusual for me and (you guessed it) disappointing. In all honesty, I didn’t hate Allegiant as much as it sounds like I did. Everything is wrapped up reasonably neatly (almost too neatly, really…) and the conclusions to the plots that existed at the end of Insurgent fairly satisfying. Most of my frustration lies in the fact that I was looking forward to a weekend spent tucked up with a riveting read and was left wanting. Would I recommend the series as a whole now that I know where it ends up? Sadly, I’m not at all sure. Overall: If you’ve read Divergent and Insurgent, this isn’t a completely terrible end to the series and I wouldn’t warn you off completely because it does wrap everything up and give you that “Ah, series complete” feeling. Just please don’t say that I didn’t warn you that it’s far from perfect and closure might be the best reward you’ll get.